Traditional methods for digging and excavating don't always work. When there are pipes or conduits buried in the area being dug up, a more modern approach has to be taken. The Hydrovac Excavation process is a non-destructive digging process that consists of injecting pressurized water and a vacuum system to dig out soil, leaving a trench completely open. Hydrovac works by injecting water into the ground through a hose, liquefying the soil. When the soil becomes a slurry mix, it is then vacuumed using a powerful pumping system and storing the wet soil mix into a truck. The process can be used to dig up to 70 feet deep in some cases and at really long distances from the holding tank or where the pumping truck is located. The excavation process can be used almost in any soil type, even in frozen ground. The hydrovac process can be completed using two different choices: using a fan system or a positive displacement blower. A fan system is able to move air in huge amounts. This allows for faster excavations. It is easier to control and operate. This is often lighter and less expensive than the positive displacement blowers. Provides a safe way to complete excavations without the needs of having a worker inside the trench controlling the excavation equipment. Hydrovac ensures that surrounding soil is not disturbed, reducing the cave-in fatalities. The excavation process is faster when compared to traditional excavation process. Slot trenching – Narrow trenches can easily be completed using the process disturbing less soil than traditional methods. This method is ideal to locate utilities or when small diameter pipes are to be installed. Debris Removal – It can be used to remove debris and clean areas without affecting existing infrastructure. It can be used to clean drainage structures and manholes. Potholing – The best way to expose underground utilities without damaging them. It is a cost-effective solution to excavate in a congested area. Excavate in Tight Spaces – Working in tight spaces, narrow streets, planting strips, or in backyards with limited spaces, the hydrovac process is one of the best alternatives to consider. Cold Weather Excavation – During freezing conditions, the controlled excavation method is the safest way to dig without exposing workers to really low temperatures. 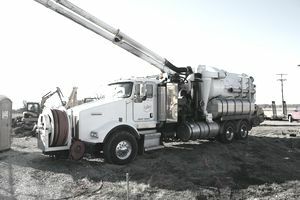 Pole Setting – Hydrovac can facilitate work related to pole drilling or excavation.